Towson, MD (USA) -- A comedy is written to make the audience laugh, a drama to entertain and hold them in suspense. Juanita Rockwell’s play “Between Trains” does something entirely different, taking the viewer on a journey through enlightenment and rebirth. “It would be great if the audience could come in and sort of come in and forget everything they know,” senior and lead in the play Caitlin Weaver said. 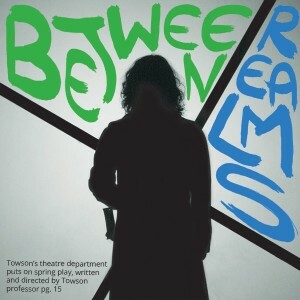 “Between Trains,” is the Theatre Department’s spring play, which opens in the Studio Theatre in the Center for the Arts on Thursday, May 1. In this production, Weaver plays the role of Wendell, a woman who goes on a journey of self-discovery over the course of the play. She must re-learn everything she knows about interaction in society, and does so through the aid of other characters, who guide her through her transition. Each of the guides bring out different negative feelings and desires in Wendell, who in turn, must learn how to digest and handle them. “It’s an interesting character to play because she is so impressionable, so I have to go through a lot of different emotions and experiences,” Weaver said. Writer and director Rockwell said that her inspiration for “Between Trains” was the idea of the six realms of Samsara, a Buddhist teaching on the Nature of the Mind shared with her by her Buddhist teacher. “He talked about the idea of these six metaphorical places ranging from the God realm to the Hell realm and kinds of experiences that we have in our lives, being caught in different kinds of negative emotions, whether it’s greed or anger or these kinds of things,” Rockwell said. The setting of the play, an otherworldly train station, comes from another Buddhist concept called The Bardo, meaning a place that is in between realms. Rockwell said that she was inspired by the concept of train stations as a place of constant transition where people move from one place to another. Set designer Mollie Singer and lighting designer Helen Garcia-Alton worked with Rockwell to create this environment on-stage. “I hope that we have created a world that is very vivid and doesn’t feel like anything from your life but somehow makes you think about things from your life,” Rockwell said. There have been two previous productions of “Between Trains,” neither of which were directed by Rockwell. The first was by the University of Maryland, and the other by Gas and Electric Arts Company, a professional theatre company. “This gave me the opportunity to direct, which means that I have done a lot of re-writing,” Rockwell said. In addition to raising the number of performers on-stage from five to 11, she also made small changes to the dialogue and song lyrics. Senior Shannon Graham said that working with Rockwell was easy due to her flexible personality and her willingness to work individually with each actor. Music was also an important part of the piece. Master of Fine Arts student Deirdre McAllister created the musical arrangements for the play, which were then recorded by the cast as a CD at Mobtown Studios. The proceeds from the CD will benefit the TU Foundation Theatre Scholarships. However, Rockwell considers it to be a play with songs, rather than a musical. “This process of casting had a lot to do with finding out, could people engage in that way…I wanted people who could move, who could sing, who could play instruments, who could be intellectually, emotionally, and physically agile,” Rockwell said. Graham said that the music in the performance supports the meaning behind the story, and senior and actor in the play Jesse Marciniak agreed. “The songs are just so beautiful and so sad, and you get to see…the audience discovering something new about these characters through the song,” Marciniak said. Weaver said that working on the play not only enriched the musical talents of the cast, but also their personal lives as well.